It's hard to believe Christmas is less than a month away!! If you're struggling with what gifts to get people, you're in look! Today I'm sharing gift ideas for the beauty lover and under $20 stocking stuffers. Also, be sure not to miss my post a few weeks ago on gifts for her and for him. Unsure what to get your significant other, mom, or dad for Christmas? Hopefully you'll find today's gift guide helpful! I tried to think through all the things I either already own and love, or things I would love to have! I also tried to think of Christmas gifts for "him" by basically thinking of what my husband would probably like and listed those below (because I know men can be so hard to buy for!). Jacket: JOLT (similar here and here); TUNIC: Mossimo (similar here (under $40!) and here); JEANS: AG; FLATS: Sam Edelman; NECKLACE: Banana Repbulic (similar here...I really want this necklace! and here); PURSE: Rebecca Minkoff; LIPS: MAC Lipstick in "Twig"
I apologize for not posting Fashion Friday posts for the past few weeks! It has been a CRAZY month and I let the ball drop on posting them. I'm planning to start posting on Fridays regularly again. I am excited to share one of my favorite things with you...PLAID! I absolutely love plaid, especially in the fall and winter! I also LOVE a good tunic sweater. This one is one of my favorites because it's thin and comfortable and long enough to wear with leggings. I would say that this sweater is my most worn sweater during the fall! COAT: H&M (similar here and also love this one); SHIRT: Treasure & Bond (similar here and here); JEANS: AG (similar here and here); BOOTS: Urban Outfitters (similar here); EARRINGS: Gorjana; NECKLACE: Baublebar; LIPS: Mac Lipstick in "Twig"
I consider today's outfit a fall wardrobe staple! 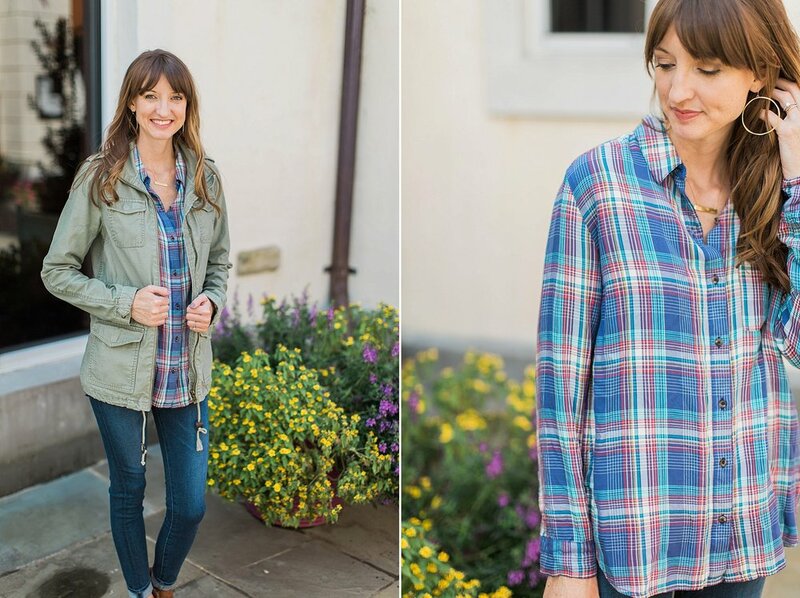 Everyone needs a utility jacket (I literally wear mine non-stop in the fall), a comfy plaid shirt, a great pair of jeans, and cute booties for fall! I absolutely LOVE this oversized, loose fit of this flannel. I also recently purchased these jeans (just recently sold out, similar here) on mega sale at Nordstrom Rack and I could not be happier! I highly recommend AG jeans to everyone! They are form fitting without being too tight or bunchy. They're amazing jeans! What do you consider fall wardrobe staples? I'm excited to share about my first experience with POPSUGAR'S must have box with you today! POPSUGAR Must Have is a popular monthly subscription box filled with amazing, unique and curated surprises. Each month, the box is filled with products ranging from fashion, beauty, home, food and more! *This box was sent to me in exchange for a review but all thoughts and opinions are my own. Honestly, this was problem my least favorite item in the box. It is certainly a good quality, wool hat. And if wool hats and fedoras are your thing, you'd probably love this hat! I'm just not much of a hat wearer and I especially don't like this fedora style on me. Unfortunately this is an item I probably won't wear. This is definitely an item that will come in handy! I love how small and portable this kit is. This is probably the item in the box I was most exited about! I'm almost out of my current deep conditioner. With the amount of styling products and heat tools I use on my hair, I try to deep condition my hair once a week. I tried this conditioner once and I was pretty happy with it! I felt that it moisturized my hair without making it too greasy or heavy. I do have thicker hair so if your hair is very thin, you may want to use this at night or on a day when you're not planning to style your hair because it will probably weigh it down. This is definitely the fanciest lint roller I've ever seen! I was excited about this because I wear a lot of black and I feel like I'm constantly in need of a lint roller. This is a really nice retractible roller you can easily carry around with you in your purse. This lip color looks a little scary in the bottle but I liked it! It's a gloss and so it doesn't come on quite as bright as it appears. It is definitely still a bold lip color, but I like that it's a little less bold then a matte red lip. It is a little sticky for my taste, but overall I like this gloss! I was really happy with these! I absolutely love chocolate coconut anything and these did not disappoint! For something that is gluten and dairy free, they have great flavor. I definitely recommend these bites! Overall, I recommend POPSUGAR's boxes! They are on the pricier side of subscription boxes, but I was impressed that this box had a $100+ value! With the exception of the hat, I really liked this box and see myself using every other item. If you're looking for a fun way to treat yourself every month, or for a gift for someone, I recommend the must have box!